Small basket, mini eggs, silk ribbon for bow, etc. Glue a bow to the head between ears. 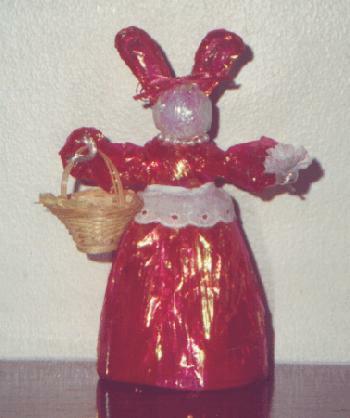 Place mini eggs in basket and put basket in Bunny’s hand. Turn the paper cup over so point is up. Cut about 1/2″ off the tip. Place the arms on the cup and glue the two strips of Clear Iridescent to front and back of cup. Cut 2 pieces of the Iridescent Pink 9 1/2″ long. Drape one piece over a shoulder and across chest. Glue to side of cup. Repeat with the second piece forming an X at chest. Cut 4 pieces of Pink 6″ long. Follow the SKIRT directions on he reverse side. Tuck finished skirt up into cup and glue. Cut the Pink wire in half and form ears. Fill in the middle of ears with Pink Iridescent. Using a toothpick, make holes in the Styrofoam head and push the ends of wire into them.